Another quick Tuesday Teaching Tactic today – can’t believe we’re already at #19! 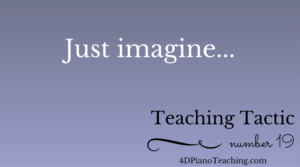 Today’s tactic is “Just Imagine…” Now to use this one, you have to start out with this phrase and then create a story or a picture with your student. For example, I’m working on a Bach Minuet with my student Robert who has no interest in Baroque dancing at the moment (you know those students who are 13 and way too cool to waltz around the room with you). So we need something else to pique his interest and get him to play those 2 note slurs correctly today. Thus I start with “Just Imagine…” and go on with something that will interest him. Maybe it’s his favorite video game Zelda and we’re imagining the footwork required as they fight on some rocky ground. The slurs can be the bend and jump he does with his legs as he moves around… And so on. 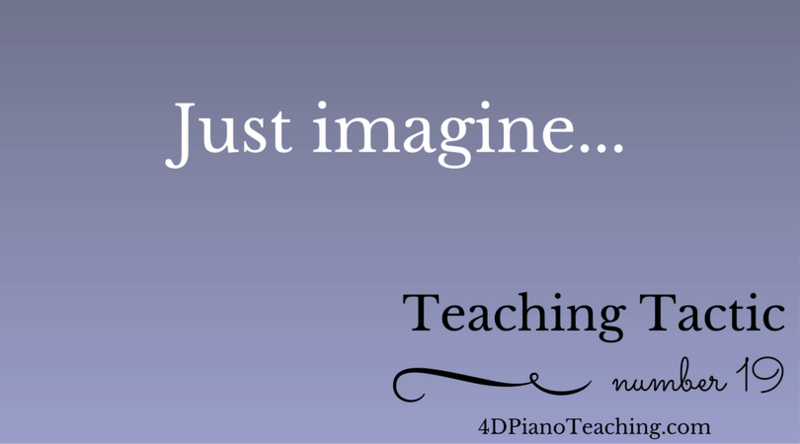 So the next time you’re trying to get your student to internalize something and “see” what’s happening better, remember to try imagining something with them. A story or a scene that they can relate to will really help. So, just imagine! Thanks for the reminder to keep looking for what works with each student!